Jean Kazez: What Happened to the Frogs? What Happened to the Frogs? Apparently many species of frogs are dying out, not only in the wild, but in zoos. What's causing the problem? Elizabeth Kolbert talks about an astonishing theory in the May 25th issue of The New Yorker. The African clawed frog was collected in the 1930s and discovered to have a medical use. 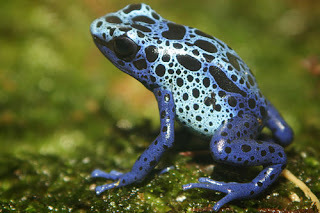 Apparently the hormones of a pregnant woman will cause this frog to lay eggs. So they were kept in tanks in European and American obstetrician's offices in the 50s and 60s, for use as live pregnancy tests. The theory is that these frogs got infected with a fungus common in doctors' offices, and then spread the fungus when they were released locally. (As in: "Whoa, we've got too many frogs. Let's let 'em go.") This doctor-office fungus is found on the bodies of frogs in Central America and in other places where frogs are becoming scarce. If this is the truth about why frogs are disappearing, it ought to be a warning against seeing endangered species as worth protecting so they can serve our purposes. It seems that when we use a species, we can be unwittingly triggering its demise.